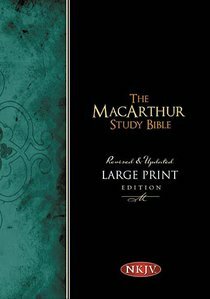 About "NKJV Macarthur Study Large Print (Black Letter Edition)"
^Over 1 million MacArthur Study Bibles sold ^Featuring the word-for-word accuracy of the New King James Version(R), "The MacArthur Study Bible" is perfect for serious study. Dr. John MacArthur has compiled more than 20,000 study notes, and numerous charts, maps, outlines, and articles to create "The MacArthur Study Bible." No other study Bible does such a thorough job of explaining the historical context, unfolding the meaning of the text, and placing it within a theological framework. It also has an abridged topical index and an exhaustive NKJV concordance. Customer Reviews For "NKJV Macarthur Study Large Print (Black Letter Edition)"
The Macarthur Study Bible is an excellent, detailed study Bible. Many of the notes are based on Macarthur's own notes from preaching through books of the Bible in great depth. The notes provide quick, concise, and accessible information to expand or explain the meaning of a verse or section. It is not as thorough as a commentary. It contains helpful extended introductions for each book of the Bible. These include authorship, date of writing, background and setting, theological themes and interpretive challenges. Unlike other study Bibles, Macarthur doesn't provide interpretive options, but rather will simply state his preferred interpretation. This will suit some readers, and frustrate others due to Macarthur writing from a narrow theological perspective on a number of issues. An excellent resource of helpful details and commentary to assist the reader understand the Word of God.